I grew up nearby Mount Katahdin and Baxter State Park in north central Maine. 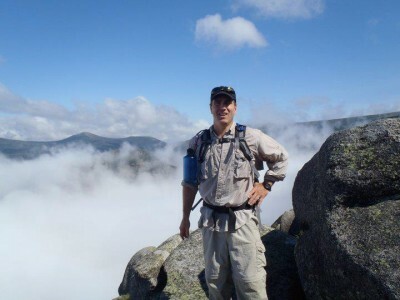 I enjoy hiking the many trails, paddling its small ponds and fishing for the parks wild brook trout. For those new to Maine or just discovering the joy of hiking and exploring wild places, I encourage you to visit. The park was generously donated to the people of Maine by Percival Baxter, Maine governor from 1921 - 1925. It took Baxter many years to raise the funds and negotiate the purchase of the land. Baxter made his final land purchase in the 1960's. Since then additional lands have been acquired and today the park has in excess of 209,000 acres. Without a doubt, the crown jewel of Baxter State Park is Mount Katahdin, Maine's highest peak at about 5,270 feet. When asked why they climb mountains, many people are often heard replying "Because it was there". Well I don't know about the rest of you but I climb mountains for the view, and Katahdin views are some of the best in Maine. The hike to the top of Maine is not for the unfit. The rugged trails to the peak all vary in difficulty but no matter which trail you pick, it is going to be a long day in the field. This is not intended to discourage you, just know you need to be prepared physically for the experience. Many not familiar with the mountain think that just a mile of elevation is but a hill. Not so, when you start as close to sea level as Katahdin does. 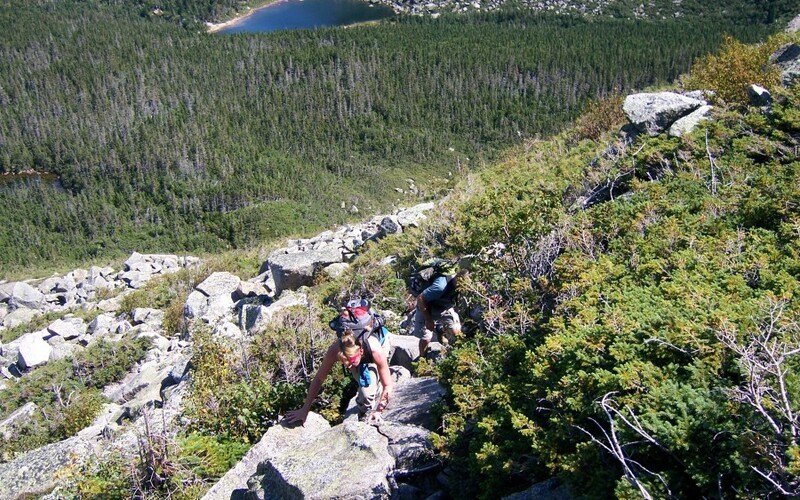 To get to Baxter Peak you have a number of options. From the Park Tote Road you can find parking near the Katahdin Stream Campground and locate the Hunt Trail. This trail is also the Maine end of the Appalachian Trail and does get a lot of use. This is one of the less exposed trails to the summit. The trail is a little more than 5 miles long. Another potential trail option accessed from the Park Tote Road is the Abol Trail. The trail was closed in 2014 because of a debris slide on the existing trail. The Park Authority has made plans to reroute the trail and last word was the trail may be completed by the fall of 2015. Do check with Park Officials before heading out for a hike. There are penalties for any use of the closed trail section. My favorite trails to the summit of Maine begin from Roaring Brook Campground. From here you will find the Chimney Pond and Helon Taylor Trail heads. The Helon Taylor Trail proceeds to Pamola Peak on the eastern side of Katahdin. From here it is just one mile across the arête known as the Knife Edge to Baxter Peak. Chimney Pond Trail is one of my favorites for a number of reasons. First it is quite scenic. Second, my wife likes to hike but is not a fan of exposed trails and heights. She enjoys hiking with me to Chimney Pond where she can spend part of the day enjoying the scenery and reading a good book. She is often rewarded with a visit by a moose to the pond. Along this trail a short off trail brings you to the Basin Ponds. The views of Katahdin's north basin from here are stunning. The reason I like this trail the most is because it gets me to my #1 favorite trail - Cathedral. The Cathedral Trail gets its name from a series of rock formations that resemble the buttresses and spires of cathedrals. The trail is short but very steep and exposed. If you don't like exposure I would not recommend this trail. If this does not bother you, the views in all directions including Chimney Pond, the Knife Edge, Hamlin Ridge and the outlying expansive forest land are amazing. There are other trails to the summit that I have not mentioned here. To see more information on these you can get both paper and online maps from the Park Service and other sources. Also, there are many other trails in Baxter State Park that don't require as much commitment as a climb to Baxter Peak. I will try to write about these in future posts.